Lenthor Engineering is providing it's rigid-flex technology to our Military's continuing efforts to promote next generation Intelligent Weaponry Technology to the battlefield. Click here to learn more about this vital life saving technology. Watch this exciting technology in action! 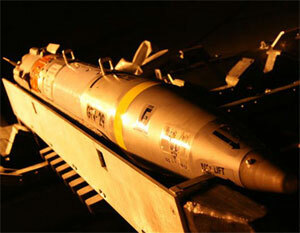 The latest weapon in the arsenal of the U.S. Air Force is the Small Diameter Bomb, or SDB. As its names suggests, it is a very small bomb, carrying less than 40 pounds of explosives. Lenthor Engineering has been supporting our nations Military, Homeland Defense and Aerospace product development and production requirements for the past two decades. We at Lenthor Engineering are proud of our participation in this essential work. We invite you to join the growing and prestigious list of companies who have placed their faith and product needs in the dedicated hands of all of us at Lenthor Engineering. Our range of program support is as diverse as sophisticated communications equipment to Direction and Environmental Management Systems on board the Mars Rover. Lenthor Engineering is truly… FLEXING AMERICA'S PRINTED CIRCUIT TECHNOLOGY.